Yell It Like It Is! I decided to reprint Dave Chesney’s impassioned article as he wrote it, so here it is! This past Sunday the Canadian music industry feted its current crop of hit makers. The affair was broadcast live from Toronto with the hosting duties going to WILLIAM SHATNER. There has been, as usual a lot of second guessing about the eventual recipients of the 2012 Juno Awards. What got my heart rate up was the induction of BLUE RODEO into the Canadian Music Hall of Fame. I will concur the band has had a lengthy history creating music and trundling coast to coast on the frozen highways of this great land. Their popularity has grown to the point whereby the two lead singers JIM CUDDY and GREG KEELOR (to a lesser extent) can perform solo across the country and still draw respectable crowds. BLUE RODEO are proud graduates of the Queen Street musical scene in “the town that cool forgot — Toronto.” Given the fact the bulk of the Canadian music industry is based in Toronto, it is only natural there is an affinity to honour those you know. I get that. What I don’t get is the glaring exclusion of one of Canada’s longest enduring, most popular and still vital performing groups. TROOPER. When LOVERBOY was inducted a couple of years ago I also felt then they were deserving, given their meteoric rise to International fame in the 80’s. I was also reminded of a TROOPER concert in 1980 at a sold out Pacific Coliseum. LOVERBOY’S debut single, “The Kid Is Hot Tonight”, was burning up the airwaves of Canadian radio stations. Their success had not yet spread to America. Seated in front me at said TROOPER show was LOVERBOY’S lead singer MIK RENO. Mid-way through TROOPER’S show, guitarist BRIAN SMITH launched into the intro notes of “The Kid Is Hot Tonight”. 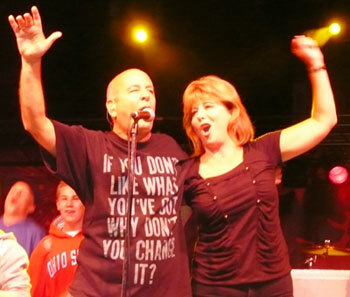 The crowd erupted, thinking LOVERBOY was set to join the band on stage. The ever familiar signature opening guitar riff caused RENO to sit bolt upright in his seat and look around. “Did I forget I was supposed to be on stage?” In one fell swoop TROOPER morphed the song into one of their classics and the show continued. As happy as I was that LOVERBOY was inducted I was shocked when I checked out the database of prior inductees. What, no TROOPER? How could that be? I could write for hours about why TROOPER should be in Canada’s Hall of Fame. But really must I? One only has to remember Surrey’s Canada Day Celebrations last year in Cloverdale where a sea of thousands of people sang in unison virtually every song in TROOPER’S set list. Mayor Dianne Watts even joined the band on stage for “Raise A Little Hell.” No other band in the history of the giant Canada Day celebrations were afforded the presence of the mayor on stage performing with them. The crowd went wild. A few years back I attended my first TROOPER all ages show at the Haney Summer Fair. What struck me that night as I looked out over the crowd was I was looking at 3 generations of TROOPER fans. Pressed against the front of the stage was a mass of early teens. A little further back in the audience Mom and dad kept a careful eye on the kids, and over on the side of the crowd, there sat Grandma and Grandpa watching the show comfortably from their lawn chairs. This year’s 2012 JUNO Awards live from Ottawa saw host WILLIAM SHATNER kick off the night of awards and music with a collection of what CARAS (Canadian Association of Recording Arts and Science) organizers of the JUNOS and Hall of Fame Inductees obviously felt were the 5 most recognizable Canadian rock compositions. Here is a very random sample of what the Canadian media has said about TROOPER over the years. – Edmonton’s up! 99.3 hosted a musical tournament all summer “to determine the ultimate feel good song” based entirely on listeners’ votes by phone and online. Trooper’s “Here For A Good Time” was declared the winner after beating out finalist “Summer of 69” (Bryan Adams). – Tune into any radio station from Vancouver to St John’s and you’re bound to encounter one of their dozen hit radio anthems that are still featured in heavy rotation to this day. – Dan Brisbois of canadianbands.com writes, “They’ve won practically every Canadian music award possible and they’ve been dubbed ‘Canada’s Greatest Party Band’ … and rightfully so.” In 2009 Bob Mersereau, author of The Top 100 Canadian Albums wrote, “Since it came out in 1979, Trooper’s Hot Shots has been one of the biggest-selling albums in Canadian music history. 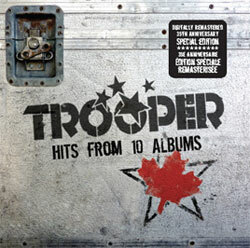 – It’s no exaggeration to say that Trooper has become a Canadian legend. They continue to perform their huge collection of hits with the vitality and sense of humor that has served them well on their steady march through the hills and valleys of Canadian Rock and Roll. Now here is where you can help. Let’s RAISE A LITTLE HELL. All you need to do is simply click on the link below and send CARAS a note asking them to consider TROOPER for induction next year. Once you have filled in the form, please forward this page to everyone you know and let’s inundate CARAS and tell them we want TROOPER in the Canadian Music Hall of Fame next year! We can do it. imagine how good we will feel next year if TROOPER can bound on stage at the JUNOS to accept their induction into the Canadian Fame. It’s great to have this direct access to Dave’s article. As I re-read it I was thinking of all the historically significant occasions where Trooper was involved. Who can forget Ra singing at game one of last year’s Stanley Cup hockey game? 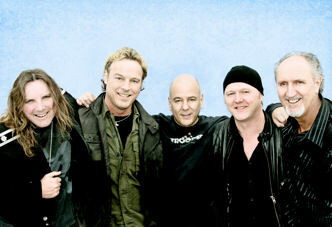 And of course, Trooper’s sold out performance at the 2010 Winter Olympics Victory Celebration at BC Place in Vancouver? Or that Trooper was chosen to close last year’s 100th Anniversary of the PNE? Canadians know they’re THE band. It’s way past time they had their place in the Canadian Music Hall of Fame. Way to go Carol! I’ll pour your tea and bring out the cookies. Thanks for your visit, and such a great comment! I hope you saw that you can put in one vote EVERY DAY? Yes, and I’m there every day! That one’s for the “Walk of Fame” nomination at http://bit.ly/GUCqIQ, the non-profit, volunteer driven organization to recognize Canadian achievement. The Canadian Music Hall of Fame, on the other hand, is I think coordinated by CARAS (Canadian Academy of Recording Arts and Sciences, for your readers who might not know), http://bit.ly/IhS1l7. I think Ra and Trooper should be in both! I am late in reading this blog but am so glad I did.I did not realize that Trooper has not been considered for induction into the Canadian Music Hall of Fame.Which i believe is a injustce to them and their Canadians fans as they are the best band to come out of this great country. I will be letting Caras know they should be inducted. Thanks for coming by, Dianne… and especially for letting Caras know that Trooper needs to be inducted into the Canadian Music Hall of Fame! Enjoy your tea while we chat for a while!